Negotiated in secret, and with the potential to erase laws in the name of profits, the Trans-Pacific Partnership (TPP) is no less than a power grab, concocted by representatives from 13 countries and 600 “advisers” from major multinational corporations. Since 2008, it had been discussed behind closed doors, away from the public’s eyes and input – that is, until someone leaked the document to WikiLeaks in 2012. Described as “NAFTA on steroids” (The Nation 27 June 2012), the TPP gives more strength to multinational corporations to sue countries for lost corporate profits due to laws or regulations. Like NAFTA, the courts which measure the validity of the arguments are not courts of the country but “corporate tribunals,” and will ultimately side with the corporations. It also redefines companies as “corporate states,” putting them on the same level as nation-states in regards to these laws. This gives them more ammunition to justify their lawsuits against nations. Fines imposed by tribunals are aimed at overturning the laws and regulations which are in the corporation’s way. 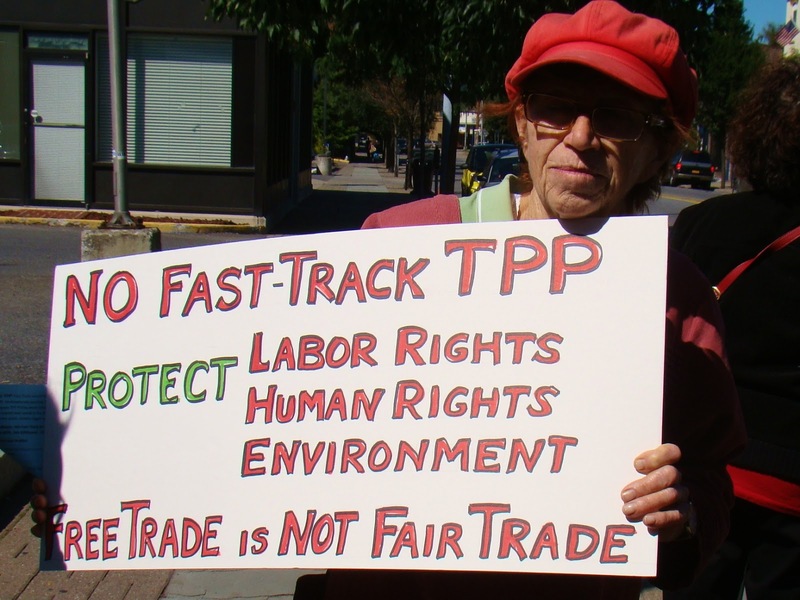 Previous free trade agreements (FTAs) show what can be expected from the TPP. In 2012, French firm Veolia sued the Egyptian government to overturn a minimum wage increase. Under NAFTA, Ethyl sued Canada because Canadians had voted to ban a harmful gasoline additive, MMT. They won $13 million in fines from the Canadian government and are now able to sell gas with MMT. Corporations have already collected $365 million by suing governments, usually in developing countries, under existing treaties. Under NAFTA, the Central American and Peruvian FTAs, $13 billion more is pending in suits. We can expect even more if TPP is signed. Many of the protections that are under attack have been won through organized struggles. Everything from pollution laws to overtime and union contracts is a potential target. 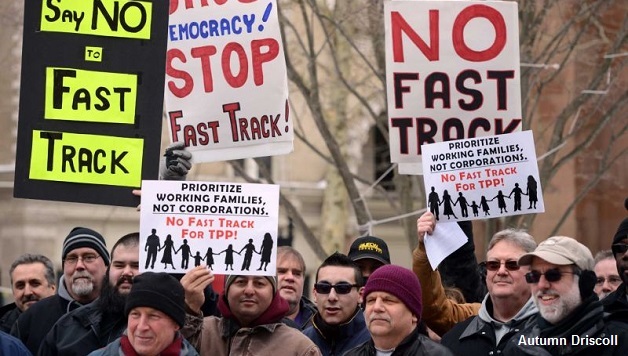 TPP is one means by which multinational corporations will try to destroy the standard of living we have won. It must be resisted – but how? 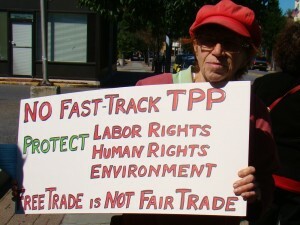 Protests, such as the ones against the WTO in Seattle in 1999, demonstrate the power of working people to fight back against FTAs and the corporate control of our society. TPP negotiations should be met anywhere and everywhere by uniting the labor movement and the environmental movement with the same intensity and message. 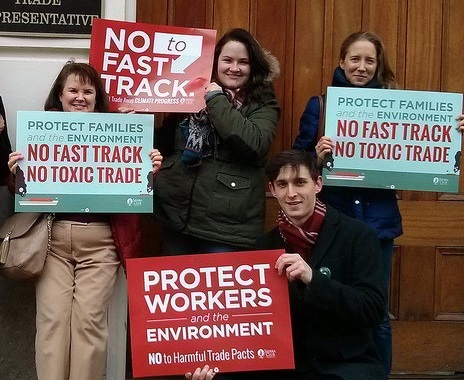 We need a trade system which actually benefits people, protects workers’ rights, and enforces environmental protections. Street protests should be linked to unions fighting for jobs and against outsourcing, as well as to environmental organizations challenging deals like the Keystone XL pipeline. This movement will inevitably run up against elected officials who operate based on the logic that corporate profits trump human needs. Movements can challenge this idea by running independent left candidates like Kshama Sawant in Seattle, as well as by building left electoral alliances like Syriza in Greece.